Cloud Native Applications at VMworld 2015! Cloud-Native Applications is an exciting new effort at VMware that involves everyone at VMware. Every business unit is, or will be involved in building and extending products that can support micro services and container-based applications. Cloud-Native Applications will have a large footprint at VMworld 2015. 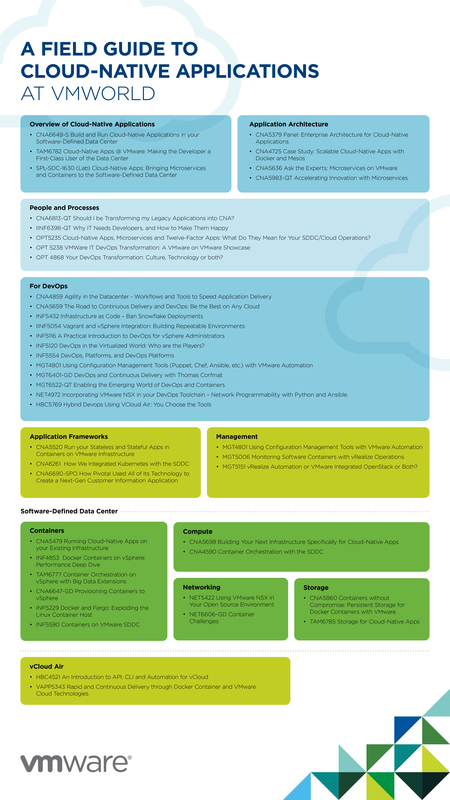 For those attending VMworld here are a few things to check out as well as a field guide that you may reference (attached). Office of the CTO Booth located in Hang Space this year. CNA DevOps Workshop on 08/31 @ 4:30-5:30 (Moscone North, near the general session area, Hangspace): CNA to host a workshop in the DevOps area discussing the use AppCatalyst, and a Photon VM running Docker. With VMware’s company wide effort and large footprint at VMworld, Cloud-Native Apps is definitely something everyone needs to check out this year. We hope to see you there!